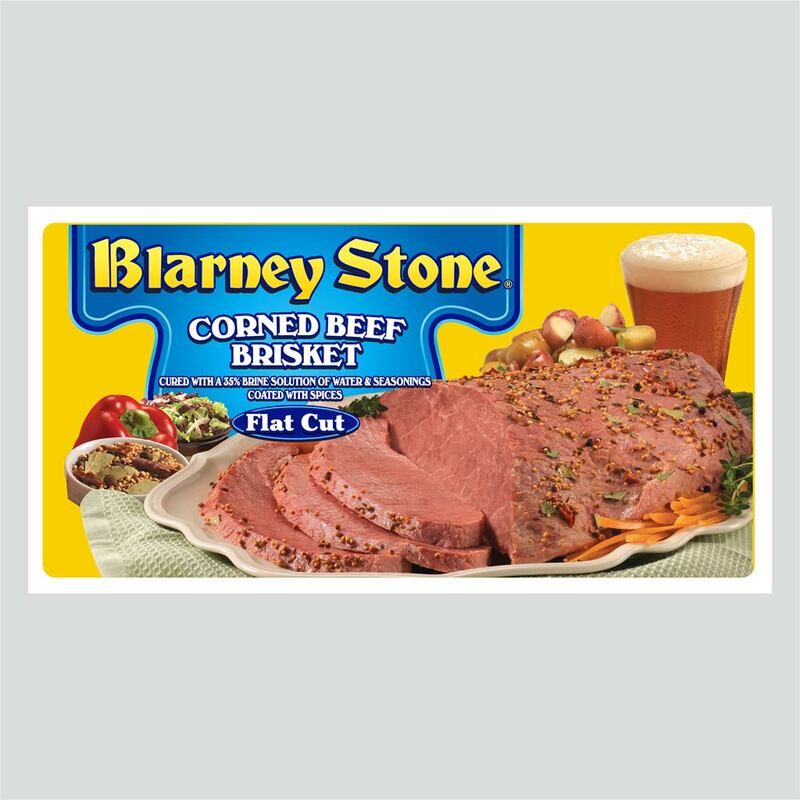 Blarney Stone - Square-H Brands, Inc. Serving size: 4 oz. (112 grams). Total Fat: 18 grams or 28% of Daily Value. Saturated Fat: 7 grams or 37% of Daily Value. Cholesterol: 65 milligrams or 21% of Daily Value. Sodium: 840 milligrams or 35% of Daily Value. Total Carbohydrate: less than 1 gram. Vitamin A: 0% of Daily Value. Vitamin C: 2% of Daily Value. Calcium: 2% of Daily Value. Iron: 8% of Daily Value. NOTE: The % Daily Value tells you how much a nutrient in a serving of food contributes to a daily diet. 2,000 calories a day is used for general nutrition advice. Beef Brisket, Water, Salt, Sodium Phosphate, Sodium Erythorbate, Spices, Natural Flavorings, Sodium Nitrite. Total Fat: 9 grams or 13% of Daily Value. Saturated Fat: 3.5 grams or 16% of Daily Value. Cholesterol: 50 milligrams or 17% of Daily Value. Sodium: 830 milligrams or 35% of Daily Value. Iron: 10% of Daily Value. Beef Round, Water, Salt, Sodium Phosphate, Sodium Erythorbate, Spices, Natural Flavorings, Sodium Nitrite. Total Fat: 18 grams or 27% of Daily Value. Saturated Fat: 7 grams or 35% of Daily Value. Cholesterol: 60 milligrams or 20% of Daily Value. Sodium: 850 milligrams or 36% of Daily Value. Total Carbohydrate: less than 1 gram or 0% of Daily Value. Serving size: 2 oz. (56 grams). Total Fat: 5 grams or 8% of Daily Value. Saturated Fat: 2 grams or 10% of Daily Value. Cholesterol: 25 milligrams or 8% of Daily Value. Sodium: 450 milligrams or 19% of Daily Value. Total Carbohydrate: 1 gram or 0% of Daily Value. Vitamin C: 0% of Daily Value. Calcium: 0% of Daily Value. Iron: 4% of Daily Value. Beef Brisket, Water, Contains 2% or less Flavorings, Sugar, Salt, Sodium Lactate, Potassium Lactate, Sodium Phosphate, Sodium Erythorbate, Sodium Nitrite. 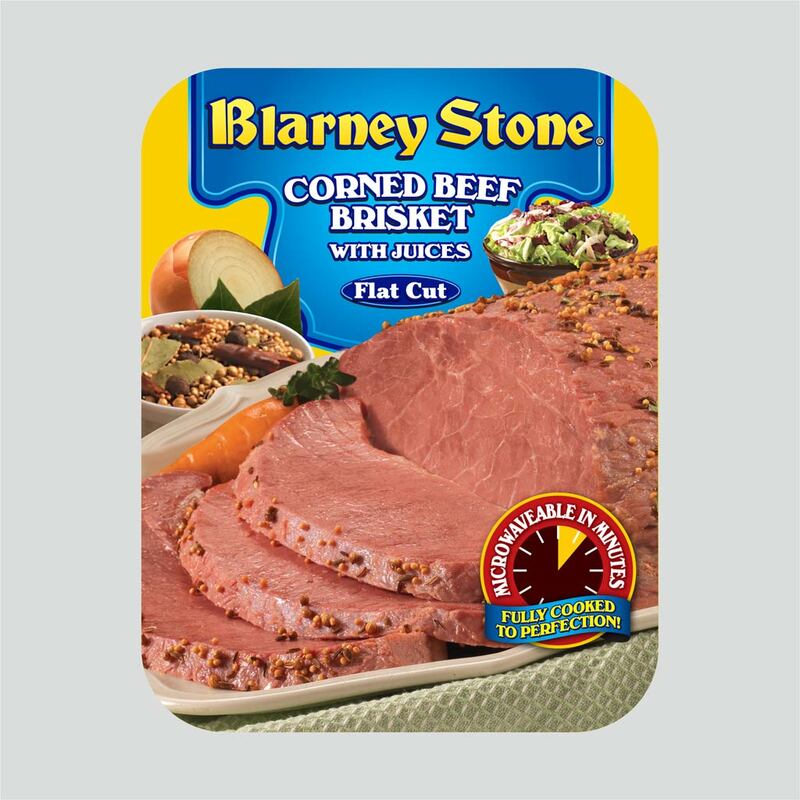 Stove Top: Remove the corned beef from its package and place in a large deep pot with a well-fitting lid. 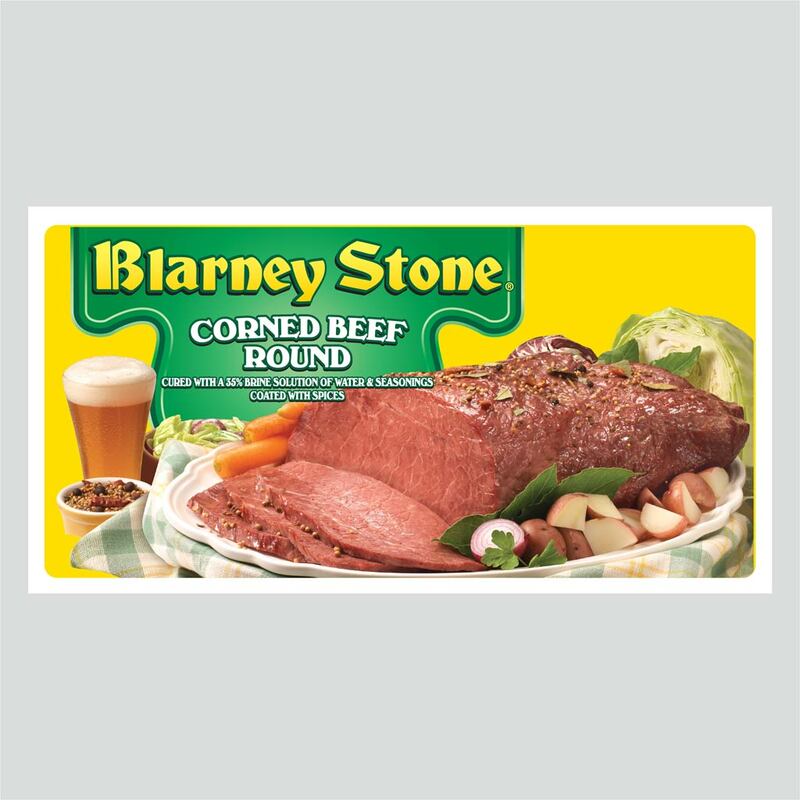 Cover the corned beef with water and include any juices that may have separated from the meat during handling. Bring to a boil, then reduce heat to simmer. Cover and cook for about 90 minutes per pound. Add any vegetables during the last thirty minutes of cooking. To test for doneness, pierce the thickest park of the meat with a large fork. If it is easy to pierce, it will be “fork tender” to eat. To serve, cut across the grain into thin slices and top with your favorite condiment. Slow Cooker: Remove the corned beef from its package and place in the slow cooker. Cover with water and include any juices that may have separated from the meat during handling. Cook on low setting for 10-12 hours. Remove from the slow cooker and allow to rest for 15 minutes. During this time, use the remaining juices to separately steam any vegetables. Microwave: Remove cardboard sleeve from tray. Leave the vacuum bag in the provided microwave safe tray. Puncture the top of the vacuum bag and microwave on High for approximately 18 minutes (allowing 6 minutes per pound). Leave in the microwave for at least 3 minutes to rest. Use caution when removing as bag will be very hot. Stove Top: Remove cardboard sleeve from tray and remove vacuum bag from the microwave safe tray. Bring a large pot of water to a boil and then carefully add the vacuum bag. Cook for 25 to 30 minutes. Use caution when removing as bag will be very hot. Keep raw meat and poultry separate from other foods. Wash work surfaces (including cutting boards), utensils and hands after touching raw meat or poultry. Keep hot foods hot, refrigerate leftovers immediately or discard. 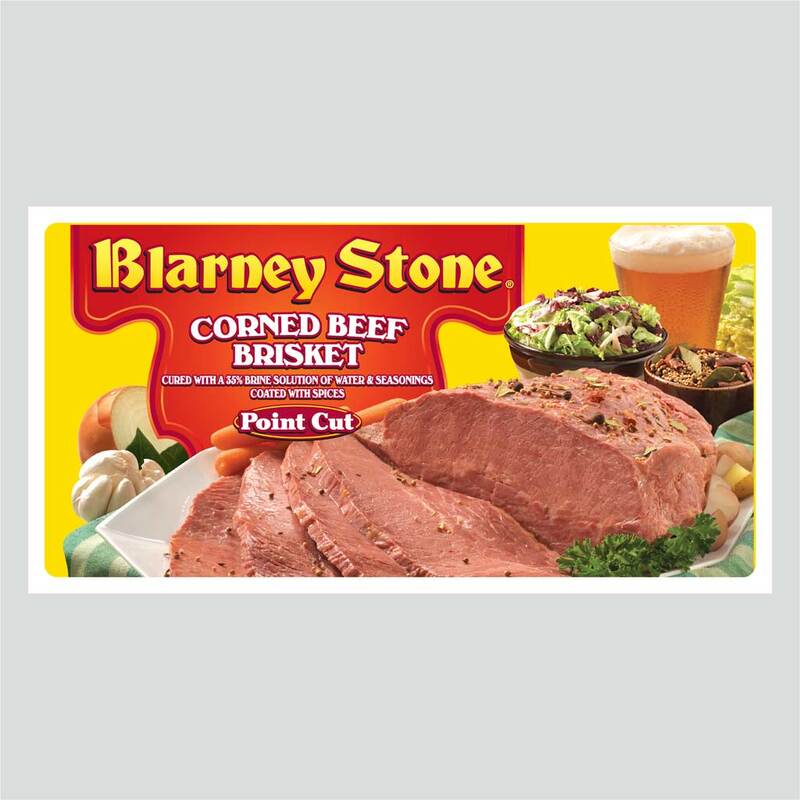 PLACE Blarney Stone Corned Beef Brisket in a large stockpot, add water and onion, celery, carrots and garlic. Bring to a boil, cover, reduce heat and simmer for about 90 minutes per pound. REMOVE brisket from pot, place on the rack of a broiler pan or roasting pan coated with cooking spray. Heat broiler. As the corned beef rests, strain cooking liquid from the pot into a large bowl (use 2 bowls if needed), discard solids. Return liquid to the pot, add cabbage and caraway seeds, bring to a boil. Reduce heat, simmer for 20 minutes. Drain. While cabbage is cooking, place potatoes in a large Dutch oven. Cover with water, bring to a boil. Cook 20 minutes or until tender. Drain. Return potatoes to pot, stir in butter, parsley, pepper, lemon rind and lemon juice. Toss to coat. COMBINE breadcrumbs and horseradish. Spread mustard over top side of the Corned Beef Brisket. Press breadcrumbs into mustard. Broil 3 minutes or until lightly browned. Serve brisket with cabbage and potatoes.